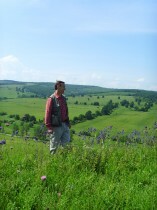 The Tarnava Mare area offers some of the finest walking country in Europe. You can walk for days through some of Europes finest pristine wildflower-rich grasslands and ancient oak and beech forests. The routes link between unspoiled villages centered on fortified churches making perfect days out or you can take shorter circular walks. Many of the routes follow historic cart tracks that linked the villages in the area for centuries. From Biertan in the west to Viscri in the south east of the Tarnava Mare area, a long distance path provides a challenge for the more energetic. Good maps and further information about area, available through Saschiz Tourist Information Centre.